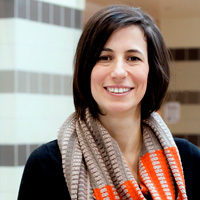 Kylie Peppler is an assistant professor of Learning Sciences at Indiana University. An artist by training and deeply rooted in the arts education community, she explores the relationships between individual, social and cultural aspects of knowledge creation though the process of creative production. Central to this investigation is Papert’s notion of Constructionism, which posits that learning happens most effectively through the creation of artifacts that are then shared with the community for feedback and reflection. Her work seeks to elaborate on the applicability of this theory particularly for visual, performing and new media arts. Peppler was recently commissioned by the Wallace Foundation to write the report, New Opportunities for Interest-Driven Arts Learning in a Digital Age (2013). Additional book publications include The Computer Clubhouse: Constructionism and Creativity in Youth Communities (Teachers College Press), Textile Messages: Dispatches from the World of E-Textiles and Education (Peter Lang), New Creativity Paradigms: Arts Learning in the Digital Age (Peter Lang), as well as a four-book series, Interconnections: Understanding Systems Thinking Through Digital Design (MIT Press, 2014). Peppler leads the Make-to-Learn initiative of the MacArthur Foundation, which leverages DIY culture, digital practices, and educational research to advocate for placing making, creating, and designing at the core of educational practice. Beginning with her work on the NSF-sponsored (ITR – 0325828) development and early study of the visual programming language, Scratch (scratch.mit.edu), she now investigates the ways that youth creatively engage with computation beyond the screen through aspects of physical computing and crafting (#0855886) as well as designs new learning environments and educational applications. Most notable of these design efforts is BioSim, a participatory simulation enhanced with e-puppetry that provides a context for classroom teachers to enable embodied, first-person explorations of complex biological systems. She is currently the lead PI on a new NSF Cyberlearning grant to pursue this work at a larger scale.